Firefighters from the village of Pewsey in the U.K. are being skewered for what vegetarians suggest was an unsavory Facebook post. The Pewsey Fire Station, about 80 miles west of London, was the grateful recipient of sausages from a local farmer. The controversy stems from the source of the meat—pigs. More specifically, piglets that were rescued by the firefighters from a potentially painful death six months earlier. The post, in which the firefighters celebrated enjoying their just deserts, went viral and spurred news stories around the world. But where there are hungry fireman enjoying grilled sausages, there are vegetarians horrified that cute and intelligent animals could be ground down into meat tubes. Critics of the Facebook post were so virulent in their criticism that the firemen pulled the post and issued an apology. “In regard to a recent post on this page. We recognise that this has caused offence to some—we apologise for this and as such have removed the post,” the fire station posted. The barbecue brouhaha began on Aug. 21 when the fire station shared about its unusual reward for saving 18 piglets and two sows from a hay fire in Wiltshire in February. “Exactly 6 months and 1 day since FFF’s Olsen and Richardson rescued 18 piglets from a farm in Milton we got to sample the fruits of our labour from that February night,” Pewsey Fire Station wrote in its now-deleted post. “Huge thank you to Rachel Rivers who gave them to us to sample,” it continued, with a recommendation to others looking for something delicious to grill on the weekend. When the gifts garnered media attention, Farmer Rachel Rivers, responsible for the idea to reward the firefighters, anticipated the pending backlash. “I’m sure vegetarians will hate this,” she told The Telegraph. The backlash was so intense that even after pulling down the original post and apologizing, the criticism continued. Some of the critics were more balanced in their views, noting the firefighters efforts but lamenting the post. 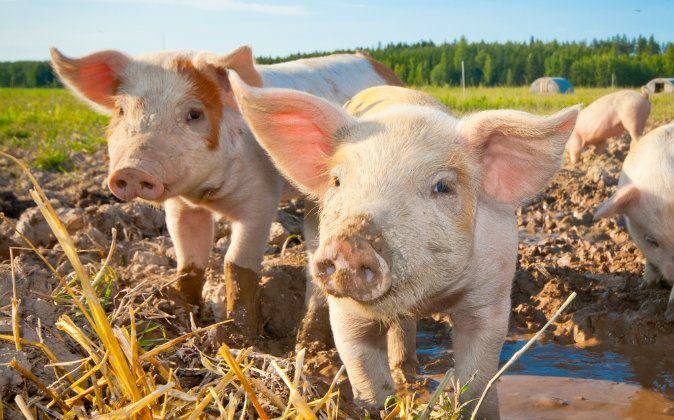 “Thank you for doing such a great job as firefighters, but the post about the piglets was not at all funny, it’s sad to think your great work has been turned into some cheap publicity for someone’s profit-making business,” commented Kjell Whall. “I really couldn’t care less if it was to do with publicity.. What i don’t understand is why do humans put there own lives at risk to save the life of an animal only to kill them months later?? And of course the farmer was gratefull she nearly lost a few quid. While these animals lost their lives either way …” added Tracey Oconnor. And some commentators were downright nasty, offering expletive laden remarks that won’t be reported here. “The very fact that you were served the exact piglets you ‘rescued’ is an intentional disrespectful and perverse act; if not the case then it would not have been specified that they were the same ones you rescued. Anyone who isn’t an absolute low life would realise that—and the fact that you supported and endorsed it is appalling. Absolute group of losers. Enjoy that you can feel better about yourselves by abusing helpless cattle,” wrote Hannah Turnbull. But there were more than a few defenders of the firefighters as well, supportive voices that offered up a different view on the roasting. “I assume everyone who complained are vegetarians. Regardless these pigs were destined for the food chain and the grateful farmer was just showing her thanks for a job well done by the firefighters in extinguishing her barn fire. It has nothing to do with cheap publicity or bad taste. Most humans eat meat and we are all aware of where it comes from,” wrote Sarah Maskell. Some of those defending the firefighters were offended at the offense and wanted the post returned. “I wouldn’t apologise … don’t bow down to yogurt weaving nimbies, with their lentil agenda. If someone wants to provide you with a sign of appreciation, for their hardwork , as a result of your hardwork and you want to share it on Facebook, No problem,” wrote user Verdant Green , adding a call to put the post back up. More than a couple of the counter critics took the opportunity to take aim at the venting vegetarians.